© Fagen et al. ; Licensee Bentham Open. The relationship between the causal agent of Huanglongbing (HLB), Ca. Liberibacter asiaticus(Las), and the naturally occurring endosymbiotic community of its insect vector, the Asian citrus psyllid (ACP), Diaphorina citri, was studied. Variation was observed in the titer of Las within an ACP population feeding on the same material. The cause of this disparity is unknown, and has implications for Las transmission and the spread of HLB. This study utilizes culture independent methods to establish the relationship between the ACP’s microbial community and Las acquisition. DNA from 21 psyllids was amplified using universal 16S rRNA primers with Illumina adaptor regions and a sample-specific 7- base identifier. These amplicons were then batch-sequenced on the Illumina platform. The resulting sequences were separated by the identifier, and compared to known sequences in a 16S rRNA database. The microbial communities of each psyllid were compared to determine whether a correlation exists between the ACP’s endosymbionts and level of Las acquisition. ACPs were dominated by the same four bacterialgenera regardless of the abundance of Ca.Liberibacter. A combination of qPCR and Illumina sequencing was used to establish an infection gradient among the sampled ACPs. The Ca. Liberibacter titer within the insect was found to have a strong negative relationship with an endosymbiont residing in the syncytium of the mycetocyte and a positive relationship with Wolbachia. These correlations have implications in the acquisition of Las by the ACP as well as the activities of Las within this vector. Keywords: Bacteriocyte, Huanglongbing, Illumina, multiplex, psyllid, syncytium endosymbiont. Huanglongbing (HLB), or citrus greening, is killing mature trees and decreasing the quality of fruit to unmarketable levels [1, 2]. Ca. Liberibacter asiaticus (Las) is the likely cause of HLB in Asia and the Americas where it is vectored by a Sternorrhynchian insect, the Asian citrus psyllid (ACP) Diaphorina citri [1,3,4]. Although Koch's postulates have never been performed with this uncultured bacterium, the correlation between disease symptoms and PCR-detection of the bacterium is very strong [5,6] and metagenomics has been used to describe the etiology of the disease in citrus . Sternorrhyncha, formerly known as Homoptera, are a well-studied suborder of Hemioptera and include: plant hoppers, scale insects, aphids and psyllids. They are all sap-feeders and have cultivated close relationships with bacteria that synthesize essential nutrients absent in their diet. These primary symbionts are often housed in the insect’s bacteriocyte. The bacteriocyte is a large fatty organ first described as ‘pseudovitellus’ . The bacteriocyte of the psyllid is a bi-lobed yellow organ located between the gonads and alimentary canal, and is present in all psyllid life stages [9, 10]. This organ is comprised of three somatic cell types: peripheral mycetocytes, central syncytia, and an outer membranous cover. Two intracellular symbionts of the bacteriocyte have been described for many psyllid species. The mycetocyte cells are inhabited by an elongated, irregular bacteria designated X-inclusion or myc-endosymbiont. While the central syncytium space harbors a separate bacteria with similar morphology known as Y-inclusion or syn-endosymbiont [9, 11]. Ca. Carsonella, Arsenophenous sp., Wolbachia, and Ca. Liberibacter sp. have also been found at varying rates of infection in psyllid populations [10,12]. Many commensal bacteria of insects are obligate endosymbionts and thus cannot be cultured or studied using traditional methods [13, 14]. Some symbionts of Sternorrhyncha, such as Ca. Carsonellarudii, have degenerative genomes and exist on the border between endosymbiont and organelle . High-throughput sequencing technologies have allowed for in-depth characterization of these bacteria and study at the community level [16, 17]. Further elucidation of the link between a host and its microbial community has led to a more complete understanding of pathogen acquisition and disease transmission, as well as holding promise for new control mechanisms for disease vectors and the microbes they spread. Las infection levels in the ACP are highly variable and in one study Las acquisition reached only 40% in a group of psyllids who fed from HLB positive citrus for 5 weeks, while in others infection rates have been as high as 88% [10, 18, 19]. However, relative abundances of other endosymbionts in infected psyllids and their interactions with Las are not known. Recent evidence suggests that Las is the only bacterium in the phloem of infected citrus plants . This suggests a very simple bacterial community in the insect vector. Here high throughput 16S rRNA sequencing of individual psyllids is used to determine the extent to which Las infection in the psyllid affects the microbial composition of the insect host. D. citri were collected from symptomatic citrus trees. Adult psyllids were kept at -20°C prior to extraction. The whole DNA of each psyllid was extracted separately using the QiagenDNeasy Blood and Tissue kit (Qiagen, Valencia, CA, USA), following the manufacturer’s instructions. DNA concentration and purity were determined by spectrophotometry. Bacterial 16S rRNA genes present within the psyllid DNA were amplified using the primers 515F and 806R  with the addition of a barcode sequence and the required Illumina adapters to construct an amplicon library from the V4 region of the 16S rRNA genes (Fig. S1). The utilization of the Illumina polymerase-binding regions allow the samples to be sequenced without supplying sequencing primers and eliminate the need for an additional ligation step. PCR was performed at an initial denaturation temperature of 94°C for 3 min, followed by 20 cycles of 94°C for 45 sec, 50°C for 30 sec, and 65°C for 90 sec. A final elongation step at 65°C was run for 10 min. PCR products were purified using the Qiagen™ PCR purification kit following the manufacturer’s protocol (Qiagen, Valencia, CA, USA). Sequencing was done on an Illumina IIx (Illumina, Inc., CA, USA) with two paired read cycles of 101 bases each. Previously described sequence analysis methods were modified in order to process paired-end Illumina data . Sequences were first trimmed for quality using a modified version of Trim2 , and the first 11 bases of the primer region of each paired read were removed to eliminate the degenerate bases on each primer. Since all samples were sequenced in a single multiplexed Illumina run, the sequences corresponding to each sample were removed from the total sequencing output based on the barcode sequences using an in-house script (splitbybarcode.py 2011, https://gist.github.com/1006983). The prokaryotic database used for 16S rRNA analysis was downloaded from RDP  and formatted using TaxCollector . References for isolates and sequences of all sizes were included. Sequences were compared to the TaxCollector-modified RDP database using CLC Assembly Cell (version 3.11; CLCbioKatrinebjerg, Den.) utilizing the paired reads and global alignment parameters. Two specific parameters were used in this step, a 98% length fraction and similarity values dependent on the desired taxonomic level, i.e., 80% at Domain/Phylum, 90% to Class/Order/Family, 95% to Genus (or corresponding OTU) and 99% of similarity to Species (or corresponding OTU) levels . Pairs that matched different references at the species level were classified at the lowest common taxonomic level. Unresolved pairs were discarded. Henceforth, successfully paired reads are referred to as ‘reads’. The degree of Las transmission to each psyllid was also determined using quantitative PCR (qPCR) to confirm the Illumina results. To evaluate the occurrence of Las in the samples, the 16S rRNA gene for each replicate DNA sample was amplified using the species-specific primers HLBasp and HLBr . qPCR was conducted in triplicate in a MX3000PqPCRThermalCycler (Stratagene). The SYBR Green assay was carried out in a 25 µL PCR mix containing 20ng of DNA template, 2X QuantiTect® SYBR® Green Master Mix (Qiagen) and 10µM of each primer. The average Ct value was determined for each psyllid DNA sample across the three replicate reactions, and compared to the Illumina results. Ct (Cycle threshold) value is the PCR cycle number at which the fluorescence of the reported dye rises above the baseline fluorescence and continues to increase exponentially. The Ct value of a sample is inversely proportional to the amount of target nucleic acid present. This method allowed for a relative determination of Las in each sample. Spearman’s (rho), and Pearson’s (r, r2 ) coefficients were used to establish significant correlations in the data using R statistical software (version 2.13; R Foundation for Statistical Computing, Vienna, Austria[http://www.R-project.org/]). An average total of 554,888 paired reads were generated for each sample with 69.4% surviving rigorous quality control tests. The average length per pair after trimming was 159.3bp. A percentage of reads from all samples could not be matched to a reference within the database. In addition, many reference sequences were not classified at all taxonomic levels. These reads were clustered at 99% sequence homology and a length fraction of 0.98 and a closest-named-match was determined and carried through to all taxonomic levels. Two methods, qPCR and 16S rRNA amplicon sequencing, were used to determine the portion of each sample consisting of Liberibacter. The results from the two methods were highly correlated (Fig. 1). 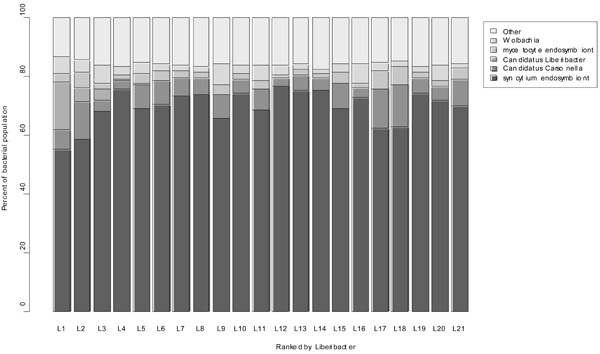 Las populations determined using qPCR and Illumina methods were highly correlated (r2=0.923). Samples where Ca. Liberibacter constitutes less than 0.1% (log10<-1.5) of the population, based on Illumina findings, were designated as ‘Liberibacter negative’. All sampled ACPs were dominated by Ca. Carsonella, Wolbacia, and previously described endosymbionts of the mycetocyte and syncytium, regardless of Las titer. Ca. Liberibacter titer is negatively correlated with syncytium endosymbiont which resides in the ACP bacteriocyte and exhibits a positive relationship with bacteria of the genus Wolbachia. Statistical analysis for both normally and non-normally distributed data show these relationships to be highly significant. Ca. Liberibacter titer ranges from 16.15% to 0.0051% of total reads. In this analysis any sample with a Ca. 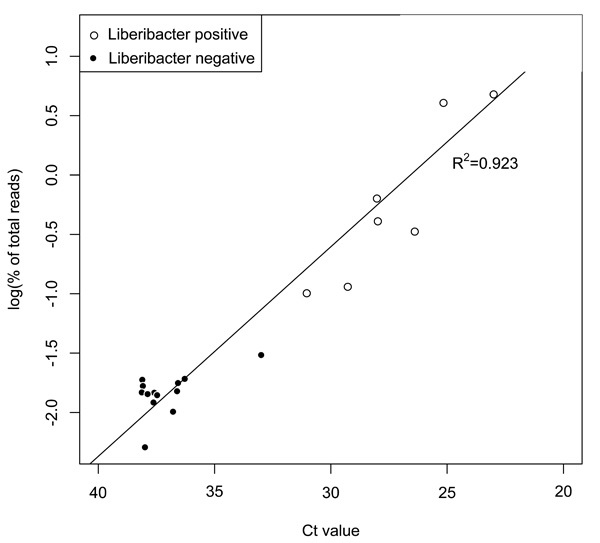 Liberibacter presence of less that 0.1% is considered to be negative and were grouped together. Likely, these psyllids did not feed from infected tissues or acquire Las at levels sufficient to affect a change in the established microbial community. Of the remaining eight psyllids, 3 have Ca. Liberibacter levels greater than 4% while the others are all less than 1%. Due to this variation, the logarithmic transformation of the Illumina percent of total reads data was used to visualize correlations with Ca. Liberibacter infection (Figs. 1 and 3). Las-negative psyllids from the sampled population were studied to establish a base-line microbiome. All were dominated by four genera of bacteria (Fig. 2). Universal commensalism of the ACP with a previously described gammaproteobacteria associated with the periphery of the bacteriocyte (Accession No. AB038367) (hereafter referred to as mycetocyte endosymbiont), the betaproteobacteria associated with the central syncytium region of the bacteriocyte (Accession No. AB038368; EF433792) (hereafter referred to as syncytium endosymbiont) , as well as Ca. Carsonellarudii, and Wolbachia sp. All other genera constitute an average of 16.1 percent of the population with no genus present at greater than 0.1 percent. An increase in Ca. 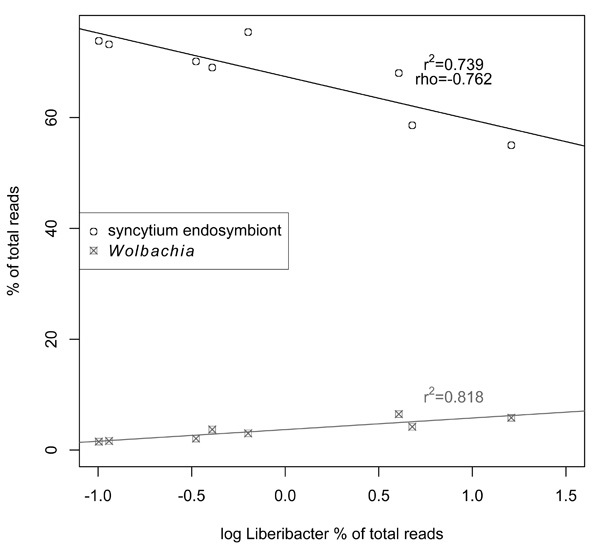 Liberibacter reads in a sample corresponds to a decrease in the percentage of total reads classified as syncytium endosymbiont. However, Wolbachia was seen to increase with the increase in Ca. Liberibacter (Fig. 3). Ca. Carsonella and mycetocyte endosymbiont showed no significant variance with Ca. Liberibacter titer (data not shown). These multiplexed 16S rRNA amplicon sequencing methods allow for the simultaneous characterization of 1435 microbial communities in a single Illumina sequencing run, with the generation of 12Mb of data for each sample. This sample number can also be increased through the utilization of additional barcodes. The ability to expand the number of barcodes is an improvement over proprietary Illumina and 454 multiplexed amplicon sequencing. This method greatly reduces the cost of sequencing each sample while increasing the depth of community characterization over qPCR or culturing. The ACP's microbiomes were analyzed along the gradient of Ca. Liberibacter infection. A low percentage of the sampled psyllids (38%) acquired Las which is consistent with rates of infection that have been reported in captive and naturally-occurring ACP populations. The underlying cause of this differential Las acquisition rate has yet to be determined . Here we investigated the link between Las acquisition and the ACP’s endosymbiotic community. These data show a negative correlation between Ca. Liberibacter infection with the percent of syncytium endosymbiontin the microbial community. However, the variation observed within the negative psyllids showed that natural variation in syncytium endosymbiont titer is present even in the absence of Las infection, although not to the extent observed in the samples with the highest percentages of Ca. Liberibacter. It is not known whether Las displaces the bacteria in the bacteriocyte or whether a naturally lower abundance of the syncytium endosymbiont facilitates the acquisition of large numbers of Las by the ACP. Interestingly, the population of another bacteriocyte-associated bacteria, mycetocyte endosymbiont, was unaffected by Las acquisition. Las is differentially distributed in the psyllid’s tissues. Infection rates are lower in the alimentary canal and salivary glands than in the rest of the body . The variable affect of Las on the endosymbiotic bacteria may be caused by the irregular distribution of Las within the host causing certain bacteria to be displaced and not others. The highest relative titer of Las within the ACP has been detected in the salivary glands and the alimentary canal, while the Las detected in the rest of the body was more diffuse . However the presence of Las in body tissues such as those of the bacteriocyte has not been investigated. A strong positive correlation between Wolbachia and Ca. Liberibacter was also observed. Unlike syncytium endosymbiont, Wolbachia is not localized in the psyllid’s bacteriocyte, and has been detected primarily in reproductive tissues . Wolbachia was ubiquitous in the psyllids tested, and the ‘negative’ samples showed great variation in the percent of the endosymbiotic community composed of Wolbachia. Wolbachia has been shown to induce host insect gene expression that creates a favorable intracellular environment for Wolbachia growth . A comparable mechanism may lead to increased Wolbachia and related increase in Las populations within the ACP. Finding an increase in Wolbachia titer with Las infection indicates a more complicated mechanism than simple replacement of indigenous endosymbionts by Las. A deeper understanding of the relationship of Las with Wolbachia and syncytium endosymbiont may elucidate the previously undescribed actions of Las within the psyllid. The authors thank William Dawson for supplying samples and for his continued guidance and collaboration. This research was funded in its entirety by The Citrus Research and Development Foundation. Bove JM. Huanglongbing: A destructive, newly emerging, century-old disease of citrus J Plant Pathol 2006; 88: 7-37. Manjunath KL, Halbert SE, Ramadugu C, Webb S, Lee RF. Detection of ‘Candidatus Liberibacter asiaticus’ in Diaphorina citri and its importance in the management of citrus Huanglongbing in Florida Phytopathology 2008; 98: 387-96. McClean APD, Oberholzer PCJ. Citrus psylla, a vector of the greening disease of sweet orange S Afr J Agric Sci 1965; 8: 298. Capoor SP, Rao DG, Viswanat SM. Diaphorina citri Kuway., a vector of greening disease of citrus in India Indian J Agric Sci 1967; 37: 572-6. Coletta-Filho HD, Carlos EF, Alves KCS, et al. In planta multiplication and graft transmission of ‘Candidatus Liberibacter asiaticus’ revealed by Real-Time PCR Eur J Plant Pathol 2010; 126: 53-60. Hung TH, Hung SC, Chen CN, Hsu MH, Su HJ. Detection by PCR of Candidatus Liberibacter asiaticus, the bacterium causing citrus huanglongbing in vector psyllids: application to the study of vector-pathogen relationships Plant Pathol 2004; 53: 96-102. Tyler HL, Roesch LFW, Gowda S, Dawson WO, Triplett EW. Confirmation of the sequence of 'Candidatus Liberibacter asiaticus' and assessment of microbial diversity in Huanglongbing-infected citrus phloem using a metagenomic approach Mol Plant Microbe Interact 2009; 22: 1624-34. Witlaczil E. Die anatomie der psylliden.Zeits Wissenschaftliche Zool 1885; 42: 569-638. Chang KP, Musgrave AJ. Histochemistry and ultrastructure of the mycetome and its 'symbiotes' in the pear psylla, Psyllapyricola Foerster (Homoptera) Tissue Cell 1969; 1: 597-606. Subandiyah S, Nikoh N, Tsuyumu S, Somowiyarjo S, Fukatsu T. Complex endosymbiotic microbiota of the citrus psyllid Diaphorina citri (Homoptera: Psylloidea) Zool Sci 2000; 17: 983-. Profft J. BeiträgezurSymbiose der Aphiden und Psylliden Z Morphol Ökol Tiere 1937; 32: 289-326. Marutani-Hert M, Hunter WB, Down S. Endosymbiotic microbiota of Asian Citrus Psyllid (Diaphorina citri) In: In Proceedings of International Research Conference on Huanglongbing; 2008; pp. 224-7. Dillon RJ, Dillon VM. The Gut Bacteria of Insects: nonpathogenic interactions Annu Rev Entomol 2004; 49: 71-92. Dale C, Moran NA. Molecular interactions between bacterial symbionts and their hosts Cell 2006; 126: 43-65. Wernegreen JJ. Genome evolution in bacterial endosymbionts of insects Nat Rev Genet 2002; 3: 850-61. Hail D, Lauziere I, Dowd SE, Bextine B. Culture independent survey of the microbiota of the glassy-winged sharpshooter (Homalodiscavitripennis) using 454 pyrosequencing Environ Entomol 2011; 40: 23-9. Jones RT, Knight R, Martin AP. Bacterial communities of disease vectors sampled across time, space, and species ISME J 2010; 4: 223-31. Pelz-Stelinski KS, Briansky RH, Ebert TA, Rogers ME. Transmission parameters for CandidatusLiberibecaterasiaticus by Asian citrus psyllid (Hemipter: Psyllidae) J Econ Entomol 2010; 105: 1531-41. Inoue H, Ohnishi J, Ito T, et al. Enhanced proliferation and efficient transmission of Candidatus Liberibacter asiaticus by adult Diaphorina citri after acquisition feeding in the nymphal stage Ann Appl Biol 2009; 155: 29-36. Caporaso JG, Lauber CL, Walters WA, et al. Global patterns of 16S rRNA diversity at a depth of millions of sequences per sample Proc Natl Acad Sci USA 2001; 108: 4516-22. Giongo A, Crabb DB, Davis-Richardson AG, et al. PANGEA: pipeline for analysis of next generation amplicons ISME 2010; 4: 852-61. Huang X, Wang J, Aluru S, Yang SP, Hillier L. PCAP: a whole-genome assembly program Genome Res 2003; 13: 2164-70. Cole JR, Wang Q, Cardenas E, et al. The ribosomal database project: improved alignments and new tools for rRNA analysis Nucl Acids Res 2009; 37(suppl 1): D141-5. Giongo A, Davis-Richardson AG, Crabb DB, Triplett EW. TaxCollector: tools to modify existing 16S rRNA databases for the rapid classification at six taxonomic levels Diversity 2010; 2: 1015-25. Li W, Hartung JS, Levy L. Quantitative real-time PCR for detection and identification of Candidatus Liberibacter species associated with citrus Huanglongbing J Microbiol Methods 2006; 66: 104-5. Ammar ED, Shatters RG, Hall DG. Localization and relative titer of Candidatus Liberibacter asiaticus in the salivary glands and alimentary canal of Diaphorina citri vector of citrus huanglongbing disease Florida Entomological Society, Jupiter, Florida Annual Meeting 2010. Werren JH. Biology of Wolbachia Ann Rev Entomol 1997; 42: 587-609. Hussain M, Francesca DF, Moreira LA, O'Neill SL, Asgari S. Wolbachia uses host microRNAs to manipulate host gene expression and facilitate colonization of the dengue vector Aedesaegypti Proc Natl Acad Sci USA 2011; 108: 9250-5.